Supporters of former Australian Labor leader Kevin Rudd have started circulating a caucus petition to allow a challenge to Julia Gillard for the prime ministership. Rudd’s forces have launched the process in the confident expectation that Mr Rudd is prepared to stand, and that he has a majority. To convene a meeting where the vote can take place, one-third of the caucus members need to sign a petition requesting a special caucus meeting. This will prove a formality. 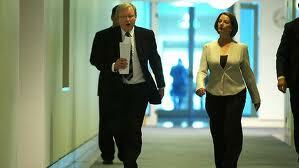 It is then at the discretion of the caucus secretary, Labor backbencher Chris Hayes, to decide the timing. Parliament is due to rise on Thursday night so the meeting is likely to be on Wednesday or Thursday at the latest. It is the last ready opportunity for a challenge before the scheduled September 14 election.